Continuing with our recent theme of Halloween time recipes, we’ve found another way to use your leftover pumpkins over the coming weeks with this pumpkin soup recipe. 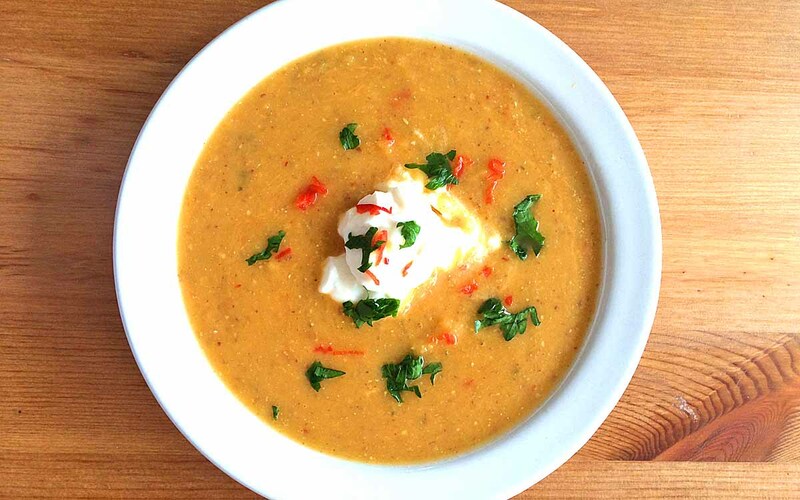 Pumpkin soup is a popular flavour served in many eateries throughout the year but we’ve decided to add a little bit of spice to ours with the addition of ginger and Thai red curry paste. 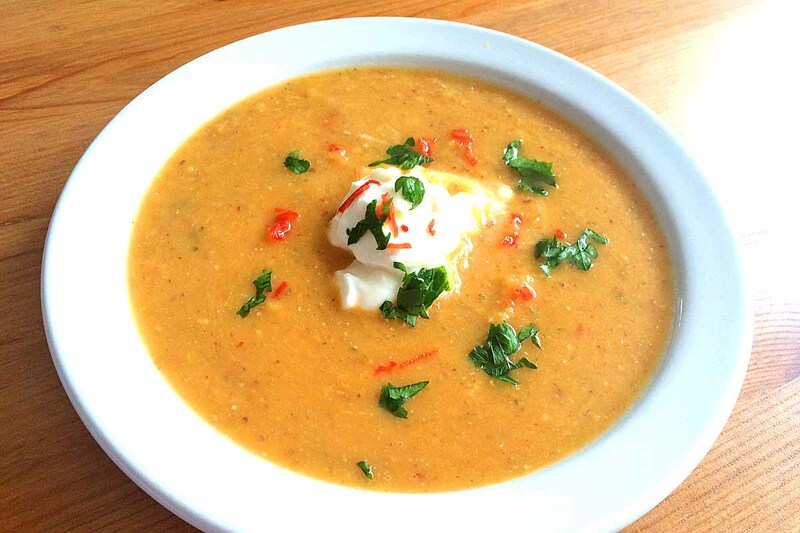 This soup only takes around 1 hour to prepare and cook, and like all soups is something you can enjoy for a few days whether it is for lunch, dinner or a healthy snack. Follow our steps below to make it yourself. Pre-heat your oven to 200C and prepare your pumpkin. You do this by peeling and deseeeding the pumpkin before cutting into chunks. Place the pumpkin chunks on to a large roasting tray and add 2 tsp of olive oil. Drizzle 1 tbsp of honey and season the chunks with salt and pepper. Place the pumpkin in the oven and roast for 30 minutes until soft and golden. Once you have roasted your pumpkin, leave aside and prepare the rest of the vegetables. Add 2 tsp of olive oil to a large pot and add the onion, leeks, ginger and lemongrass. Cook the vegetables for 10 minutes until soft. Now for the heat! Add the Thai red curry paste to the mix and then add the roasted pumpkin chunks and the juices. Next you add the coconut milk and vegetable stock (you could use chicken stock if you prefer) and simmer for 5 – 10 minutes. We then added 2 tbsp of Linwoods flaxseed, sunflower and pumpkin seeds but you don’t need to do this if you don’t have them. Before you blend all of the ingredients together remember to remove the stalk of lemongrass as this will not be pleasant if blended with everything else. Add juice of one lime and allow to cool the mix slightly before blending all of the ingredients together. Blend until the mix is a smooth, soup-like texture and then return the pan to the heat, gently heating through for a few minutes. Garnish with some red chilli, corrainder and natural yoghurt before serving. If you’re looking for some desserts to try out this Halloween, why not try out our chilli chocolate bonfire cake and pumpkin pie recipes. These will be a great way to finish any meal during the winter months. Share your favourite Halloween recipes with us by commenting below. 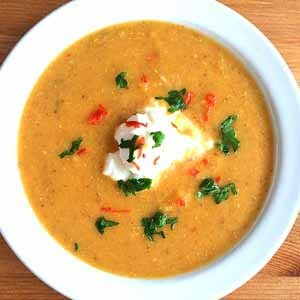 We recorded a video for Linwoods Healthfoods of this spiced pumpkin soup recipe. Check out the steps below and enjoy trying to recreate it in your own kitchen.Be sure to check out our Twitter and Facebook pages too.